When this blog first started, those of us interested in what our neighborhoods used to look like in the far past had to trek to libraries and archives all over town to find old maps, then figure out a way to photograph or scan the most useful. To understand how these maps related to the contemporary landscape, I used to superimpose scans of old maps over contemporary ones by using Adobe software- a slow, cumbersome, and inaccurate process! Since then, there has been an explosion in the quality and quantity of map resources online. Best of all, some have already been georeferenced (digitally located in physical space), which means that anyone can very casually compare any neighborhood now to what it was 100 years ago by using a slider. I am fascinated by the messiness of the historical landscape before it was flattened and filled, with water confined to neatly linear paths. There are so many notations mapmakers used to depict the ways water manifested in the historical landscape. William Hammond Hall’s maps go beyond mere notation, into the realm of artistic representation. In contrast, USGS maps of contemporary Los Angeles use a limited and inflexible set of icons to depict water: blue lines for waterways (thin or thick, solid or dashed), and blue amoebas for lakes. Does the simplicity of these icons reflect what we’ve done to our surface water; or has what we’ve done to our surface water reflect our simplistic cultural idea about how a water body is supposed to look like and behave? Early aerial photos are another great resource for armchair creekfreaking. UCSB’s collection of aerial photography, which spans the last century, is now easier than ever to access online. Just zoom in to an area that you would like to see, then select an area to browse aerial photos in the collection. Look for photographs taken before the great stormwater engineering projects of the midcentury. I’m attending the “Building a Healthier San Gabriel River Watershed” conference in El Monte today and tomorrow. Thanks to the Los Angeles and San Gabriel Rivers Watershed Council for hosting. For me, today’s stand-out presentation was by Eric Stein of Southern California Coastal Water Research Project (SCCRWP, affectionately called “skwurp.”) Stein, with others, is the author of a report called Historical ecology and landscape change of the San Gabriel River and floodplain which is available on SCCWRP’s website as Technical Report No. 499 (a 17MB PDF file.) 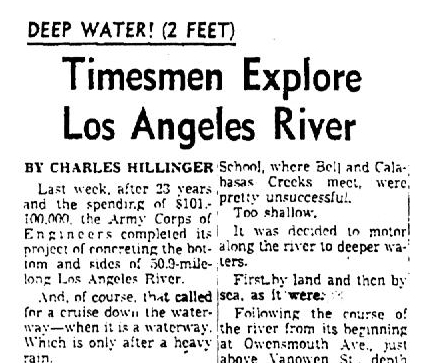 Jessica referred to this report in an earlier blog about L.A.’s historic streams. 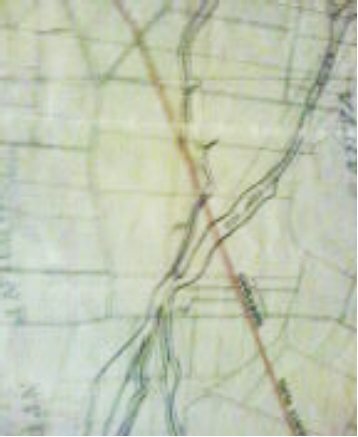 Stein’s team compiled various historic San Gabriel River sources. 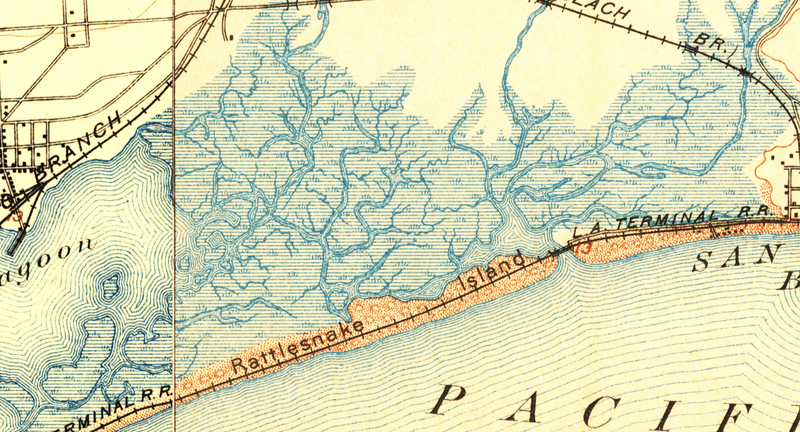 Primary sources included coastal resources mapping (1850s-1880s), Disenos – Spanish Land Grant maps (1830s-1860s), Irrigation maps (1880s), soil survey maps (early 1900’s) and early aerial photos – as well as secondary sources including the early County Flood Control District Interviews (that Jessica fondly blogged about here and here.) From these, the team was able to map the changing historical configurations of the San Gabriel River. In early accounts, the San Gabriel River was a tributary of the Los Angeles River. Their confluence was where the Rio Hondo meets the L.A. River today. In heavy rains in 1867 the San Gabriel River shifted out of its bed and moved to more-or-less its present course, emptying into the Pacific Ocean at Seal Beach. Initially the new San Gabriel River course was simply called “the new river.” Over time, the new river came to be called the San Gabriel and the old San Gabriel was re-named the Rio Hondo. This shifting behaviour is not unusual for Southern California Rivers, which tend to move around the relatively flat alluvial plain. The shifting courses of the L.A. River are mapped in Gumprecht’s book. Our rivers have many mouths, many distributaries. Indeed, Stein makes the case (as the Watershed Council does) that the San Gabriel and Los Angeles Rivers are historically inseparable. They’re one overlapping and intermingling system. Stein further states that the very dynamic local San Gabriel River system consisted of large continuous zones of floodplain – a large swampy area with sloughs, lakes and wetlands dotting the landscape. These would sometimes dry up leaving vast seasonal alkali flats. Stein characterized the main drivers of changes to the landscape (that is: near total loss of historic wetlands) as including: transportation (initially railroads followed by impermeable automobile roads), extraction of groundwater, and construction of flood control infrastructure. The report has lots of excellent color maps that tell the story well. 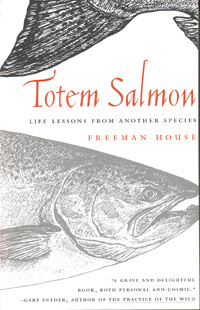 I will try to get some of these and blog them here soon. The free conference continues tomorrow from 10am to 4:30pm. Sorry for not blogging this sooner, but if you’re interested in the San Gabriel River, come on down and join us at the Grace Black Auditorium at 3130 N. Tyler Ave in El Monte, CA 91731. You are currently browsing entries tagged with History at L.A. Creek Freak.